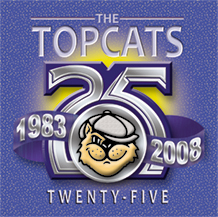 On March 14th, 2008 The Topcats released “Twenty-Five”, a collection of sixteen songs recorded in celebration of The Topcats 25th Anniversary! All songs were recorded at the Apartment Studio in Jefferson, LA. in February of 2008. 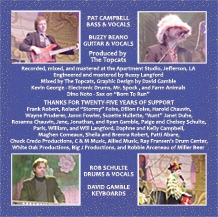 This recording was produced and mixed by The Topcats, with engineering and mastering by Buzzy Langford and graphic design by David Gamble. Twenty-Five contains a great variety of musical styles. 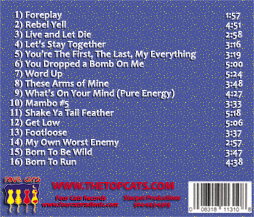 Many of the CD tracks are songs that Topcat fans have requested over the years, while others are favorites of the band. The sixteen songs are “Foreplay”, “Rebel Yell”, “Live and Let Die”, “Let’s Stay Together”, “You’re The First, The Last, My Everything”, “You Dropped a Bomb On Me”, “Word Up”, “These Arms of Mine”, “What’s On Your Mind (Pure Energy)”, “Mambo #5”, “Shake Ya Tail Feather”, “Get Low”, “Footloose”, “My Own Worst Enemy”, “Born To Be Wild”, and “Born To Run”. The disc also contains a surprise track that is quite different. Let the disc continue to play at the end and you will see! Check out the songs in the player below. “Born To Run”and “Live and Let Die”, are two band favorites, whereas “Let’s Stay Together” and “Shake Ya Tail Feather” are two fan favorites!